An introduction to our features. Mr. Turnbull takes a look at the problems faced when different character sets and the need for standardization. Linux drives the experimental vehicle of the University of Parma. An introduction to the GNU gettext system for producing multilingual programs. Dr. Mann describes his WearComp (“Wearable Computer”) invention as a tool for “Mediated Reality”. WearComp originated in the context of photographic tools as true extensions of the mind and body and evolved into a philosophical basis for self-determination, characteristic of the Linux operating system that runs on WearComp. A look at multilingual Emacs. The cool way to make secure transactions. An overview of two applications for spacecraft and why these applications are being run on Linux. Linux enters the mainstream as companies such as Learning Tree and Caldera offer training courses for Linux. Here Learning Tree tells us why they are doing it. Another high school student brings Linux and the Internet to his fellow students. A look at one of the fastest growing Linux distributions, that you may never actually see. 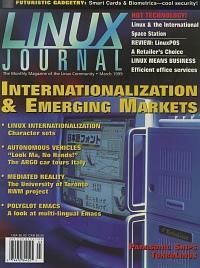 How the Linux operating system made possible cost-effective company e-mail and created opportunities for adding useful services. Mr. Lerner shows us how to add a full-text search to our BBS. Mr. Aznar talks about problems and solutions to adding the EURO symbol to the keyboard.